Part of the 'mea culpa' series. Hopefully, a very occasional series. In several parts. Because of the picture quality, I can’t se the vessels reach the Costa. I therefore can’t exclude bilateral pneumothorax. 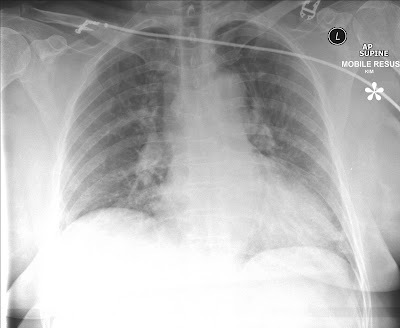 The Cor represent over 50 % of the thorax width, but I assume it is a horizontal view? Is there a dissection of the aorta? + PTX, + MDS widening, ? Aortic Arch inj. CT Result ?